Saturday, Feb. 3 — 14th Annual College Show, noon-4 p.m., Aurora Gallery, ArtsWorcester, 660 Main St. The former Aurora Hotel is but one of myriad historically significant buildings in the city. It was built at the turn of the century — not this one, the last one; y’know, when America was America and we fought fascists rather than electing them — and was once surrounded by an apple orchard. Its real claim to fame is being the birthplace of automatically locking elevator doors. Go figure. Maybe in another century or so, the Aurora will be surrounded by self-sustaining urban gardens and remembered as the birthplace of the career of America’s next great artist who debuted their seminal works at the 14th annual ArtsWorcester college exhibition. Featuring 65 student artists, the exhibit runs through March 2. Regular gallery hours are noon-4 p.m. Thursday-Saturday. Or schedule an appointment. Tuesday, Feb. 6 — Worcester State hockey vs. Assumption, 7 p.m., Worcester Ice Center, 112 Harding St. When it was announced that the Worcester Railers were accepted into the ECHL and would begin play this winter, owner Cliff Rucker and team officials made clear that propping up the existing youth, scholastic and collegiate hockey scene in the city would be a priority. And now several teams, including Worcester State, skate their home games at the gleaming new Canal District rink complex owned by Rucker. The Lancers, 11-6-1 at press time, are paced by senior winger Mike Moran of Milford (13 goals, 10 assists), whose 23 points were among the top 10 in the MASCAC. Senior forward Cam Laughlin of Natick leads the Greyhounds (11-8-2) and Northeast-10 Conference with 25 points (13 goals, 12 assists); teammates Tommy Mahoney and Brian Farrell were tied for second with 20. Thursday, Feb. 8 — Silkroad Ensemble, 7 p.m., Brooks Concert Hall, College of the Holy Cross, 1 College St. If you’ve never heard Galician bagpipes played by a master, then … well, you’re pretty much like the rest of us. What’s a Galician anyway?! 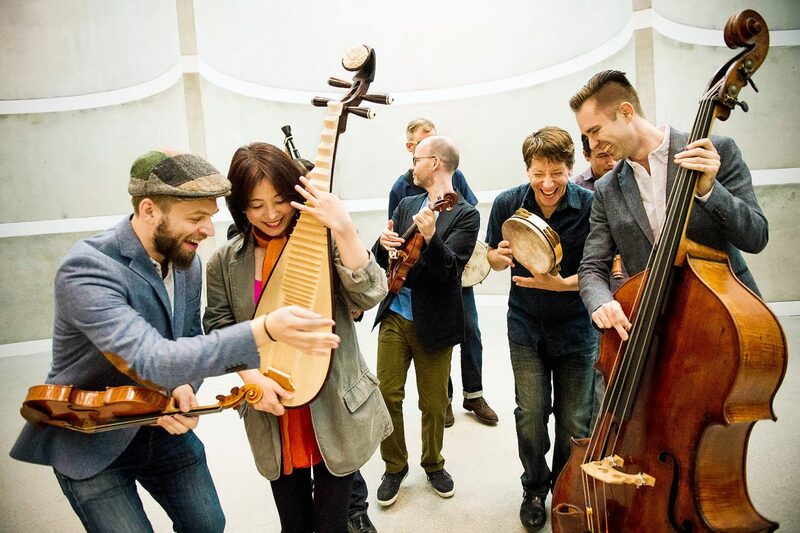 So when the Silkroad Ensemble comes to town — spreading its message of inclusion, passion for learning and hope for a better tomorrow — with a Galician bagpipe virtuoso on the roster, you can’t pass up that opportunity. Right?! Founded by famed cellist/humanitarian Yo-Yo Ma in 1998, the ensemble is an ever-changing group of musicians with the mission of “sparking radical cultural collaboration.” The concert is part of a five-day residence, in which the ensemble will engage Holy Cross students through workshops and learning sessions. Tickets are $15, $10 for faculty and staff, $5 for students. Friday, Feb. 9 — Jimmy Tingle: Humor for Humanity, 7:30 p.m., auditorium, Ayer-Shirley Regional High School, 141 Washington St., Ayer Most of us know Jimmy Tingle from his run as New Andy Rooney for “60 Minutes II” or, if you’re really paying attention, maybe as the priest in the 1999 cult classic film “The Boondock Saints.” But then, if the Harvard-educated comedian and actor has his way, all of us will know him soon as Mr. Lieutenant Governor, sir. Yup, last autumn Tingle announced his intentions to run for the seat as a Democrat. Being honest, a debate between Tingle and Shrewsbury’s own Karyn Polito at Mechanics Hall sounds like a lot of fun. Until then, though, you can get a load of Tingle’s latest schtick high school auditorium style. Proceeds benefit the Ayer-Shirley regional schools and the high school drama program. Tickets are $25 for general admission, $35 for VIP seats and a meet-and-greet. Saturday, Feb. 10 — New England’s Future 5, 7 p.m. [doors at 6], The Palladium, 261 Main St. Jose Antonio Rivera, Worcester’s very own world champ, knows a thing or two about being the future of boxing. The longtime welterweight began fighting professionally in the early 1990s, in venues like the Lowell Sheraton and Webster Municipal Building. He won his first 23 fights before a split-decision loss at Foxwoods in 1996. His first title came in 2003 in Germany, and he successfully defended his belt in a 2006 DCU Center bout. As with most boxers in their 30s, his career had peaked. In the years since, Jose has become a sort of pied piper in Worcester and now, along with his son Antonio, he’s built up a promotions company. Its first event of 2018 features city boxing legacy Bobby Harris III, whose father remains Worcester’s most decorated amateur pugilist, and rising contenders Kevin Cobbs and Richie Rivera. Tickets are $45-$75.